A dramatic arched glass window and multiple gables give an elegant feel to this four bedroom country farmhouse floor plan with bonus room. Round columns set an elegant tone in the living/dining room and in the great room. Both living room and great room have fireplaces. A first floor bedroom doubles as a study and the island kitchen is open to the great room and deck for easy entertaining. 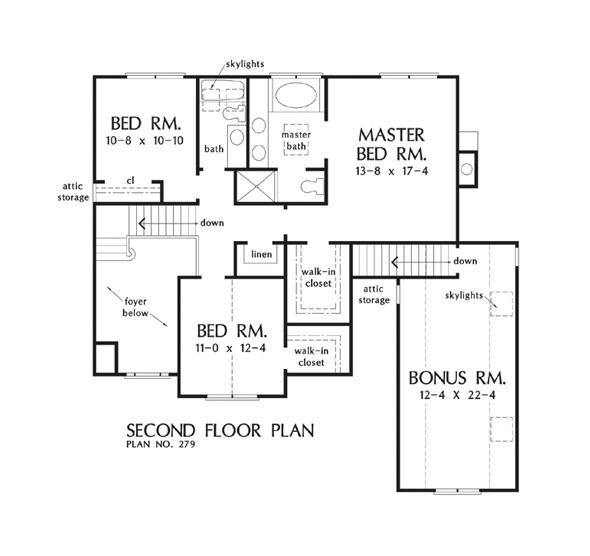 The second floor master bedroom has all the luxuries including separate shower and whirlpool tub. 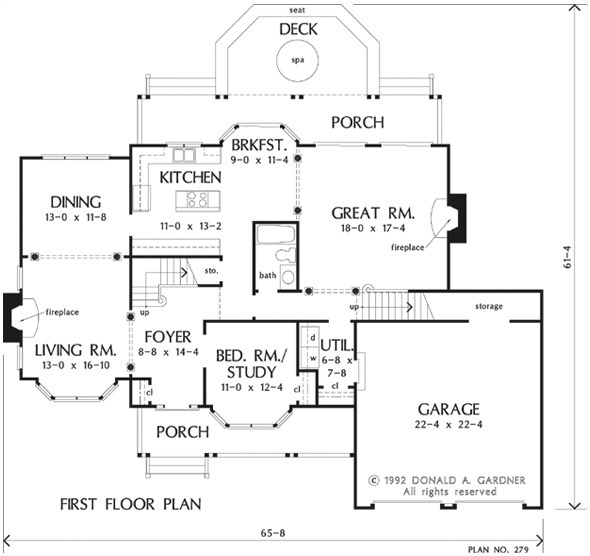 House Dimensions: 65' 8" x 50' 4"
Master Bedroom: 13' 8" x 17' 4"
Garage Storage : 18' 6" x 3' 4" x 0' 0"
Master Bedroom : 13' 8" x 17' 4" x 8' 0"
Bedroom / Study : 11' 0" x 12' 4" x 8' 0"
Bedroom #3 : 10' 8" x 10' 10" x 8' 0"
Bedroom #4 (Cathedral): 11' 0" x 12' 4" x 11' 10"
Porch - Rear : 37' 0" x 6' 0" x 0' 0"
Deck / Patio : 19' 11" x 11' 0" x 0' 0"
Living Room : 13' 0" x 16' 10" x 8' 0"
Storage (1st Fl.) 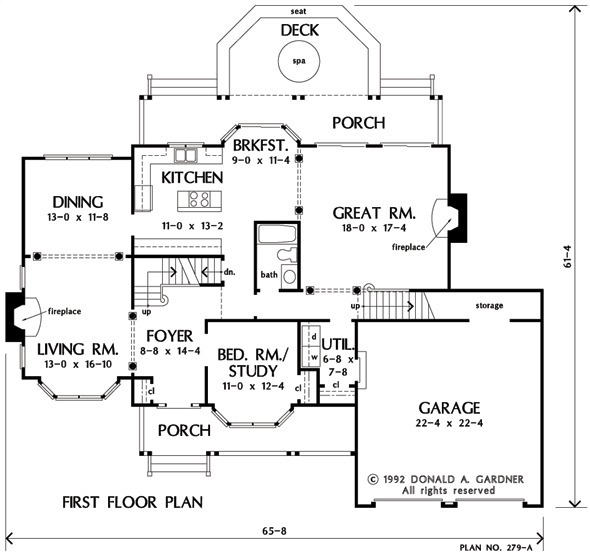 (Sloped): 7' 0" x 3' 2" x 0' 0"
Foyer (Vaulted): 8' 8" x 14' 4" x 17' 0"
Dining Room : 13' 0" x 11' 8" x 8' 0"
Great Room : 18' 0" x 17' 4" x 8' 0"
Kitchen : 11' 0" x 13' 2" x 8' 0"
Breakfast Room : 9' 0" x 11' 4" x 8' 0"
Utility Room : 6' 8" x 7' 8" x 8' 0"
Bonus Room (Vaulted): 12' 4" x 22' 4" x 8' 0"